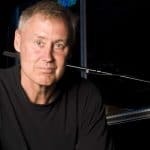 The day before Bruce Hornsby’s new release Absolute Zero, he joined Stereogum in studio.You can watch a video below. Bruce plays through White Noise, Cast Off, Fractals and The Way It Is. We also held a Facebook Watch Party, so thanks to those who joined, liked and commented as we watched. On Wednesday he played a gorgeous solo version of Cast Off which you can hear on the WNYC website. Absolute Zero is out tomorow, April 12.